The golden dome of bulky St Isaac's Cathedral (Isaakievsky sobor), looming just south of ploshchad Dekabristov, dominates the St Petersburg skyline. The Frenchman Ricard de Montferrand won a competition organised by Alexander 1 to design the cathedral in 1818. It took so long to build-until 1858 - that Alexander's successor Nicholas 1 was able to insist on a more grandiose structure than Montferrand had planned. Special ships and a railway had to be built to carry the granite for the huge pillars from Finland. There's a statue of Montferrand holding a model of the cathedral on the west facade. 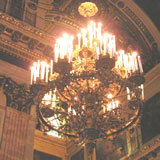 St.Isaac's Cathedral is a remarkable monument of Russian architecture. This grand structure filled up the space of the Senate Square, and created a new square as well. Alongside with the Peter and Paul's Cathedral and the Admiralty it became an important architectural landmark in the city outline. The golden dome of St.Isaac's can be seen from any part of the city, and in clear weather - even from the suburbs. The history of the construction began in 1710, when the first wooden church was put up in honor of St.Isaac of Dalmatia; it was on St.Isaac's day, according to the Orthodox calendar, that Peter I was born. The present Cathedral is the fourth erected on the site. In the early 19th century a contest was arranged for the best project of a new cathedral, in which the most well-known architects took part. In 1818 Alexander I approved a project submitted by A.Montferrand, a talented drawer who had just arrived from Paris; however, he had had but little experience in architecture. It took forty years to build the cathedral. Three years after the construction had started it came to a halt because of a number of mistakes made in the project and during the building process. A special commission of notable Russian architects was formed. In 1825 the construction works were resumed according to the corrected project. Lots of complicated engineering problems were to be solved for the first time in history. In 1828, even before the walls were erected, installation of the 48 monolithic columns was started, that were to form the porticoes, each weighing about 110 tons. The ideas of A.Betancourt, an engineer, made it possible to raise the 67-ton granite columns to the height of 40 m and install them around the dome drum. St.Isaac's Cathedral is one of the largest domed structures in the world. The building, being rectangular in its layout, rose 101.5 m high. Having the area of 4 thousand sguare meters, the Cathedral can hold up to 12 thousand people. The dome is of an original construction, practically including three domes, placed one over other. The cathedral, faced with light-gray marble from Olonetsk, was completed by 1842; however, it took sixteen years more to decorate the interior. A lot of valuable materials were used, among them lazurite, malachite, porphyry, all kinds of marbles. The walls and vaults of the cathedral bear paintings and mosaic works made by well-known Russian artists: C.Briullov, F.Bruni, P.Basin, P.Shebuyev and others. On the whole more than 200 artists took part in the works. The great plafond of the big dome with the area of more than 700 square meters was painted by C.Briullov. Both inside and outside the cathedral is decorated with sculptures made to the designs by I.Vitali, N.Pimenov, A.Loganovsky, P.Klodt and others. It was for the first time that the galvanoplastics method developed by B.Yakoby was used for making monumental sculptures. 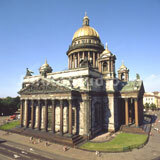 The cathedral, that stands out for its grandeur, was sanctified in 1858 and became the main church in Saint-Petersburg. Metro - Gostinyy Dvor or Nevsky Prospekt. Open Thursday through Tuesday, from 11.00 am to 06.00 pm.